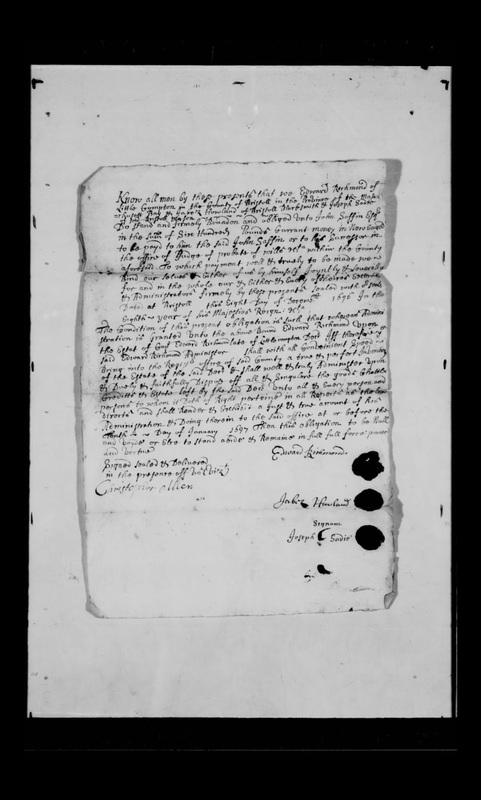 Genea-Musings: Amanuensis Monday - Probate Records for Estate of Edward Richmond (1632-1696) of Little Compton, R.I.
Amanuensis Monday - Probate Records for Estate of Edward Richmond (1632-1696) of Little Compton, R.I.
in the presence off us Viz. 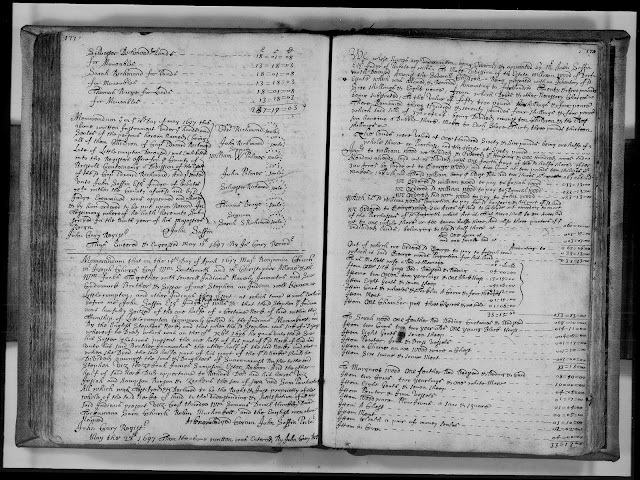 Bristol County, Massachusetts, Probate case files, Case File 21447 Edward Richmond of Little Compton; "Bristol County (Massachusetts) Probate Records, 1636-1899," digital images, New England Historic Genealogical Society, American Ancestors (http://www.americanancestors.org: accessed 15 April 2018). have payde, and stand Engaged to pay Since his Decease. The debts and charges totaled 64 pounds, 0 shillings, 7 pence. Thus Entered & Recorded May 19 1697 By John Gary Regist^r. Thus Entered & Engrossed May 19^th 1697 By Jn^o Gary Record^r. "Probate Records, 1687-1916; Index, 1687-1926 [Bristol County, Massachusetts]", digital microfilm images, FamilySearch (http://familysearch.org : accessed 15 April 2018),"Probates, v. 1-4 1687-1723 Vol. 3 ends p. 337 (1710-1716), Lacking 1717-1720. Vol. 4 begins 1721" (US/CAN microfilm 0,461,882)," Volume 1, pages 175-177 (images 96-7 of 745), Edward Richmond administration papers. Edward Richmond (1632-1696) married (1) Abigail Davis (1637-1682) in 1658 in Newport, and they had eight children born between 1658 and 1672. He married (2) Amy Bull (1632-1696) in 1678, and they had two children. Edward Richmond died in November 1696, and his wife Amy died in December 1696. It is not known if son Edward Richmond received all of the estate and had to pay all of his siblings their share, or if the real estate and personal estate were sold and Edward divided the proceeds between the children, after paying the debts and charges. Note that Edward made an error in the account and overpaid the heirs by 1 pound, 13 shillings, 10 pence. 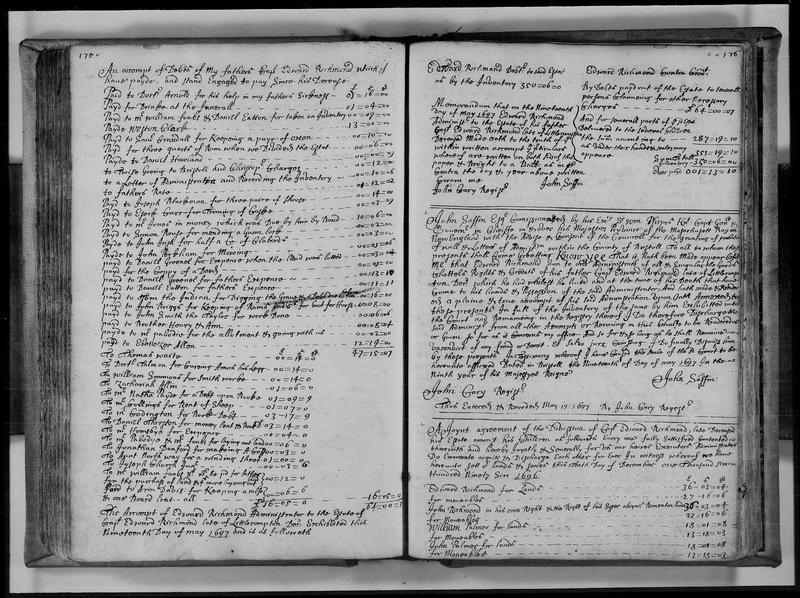 The heirs to whom the estate was distributed were: Edward Richmond, John Richmond (who claimed his sister Abigail Remington's portion also), William Palmer (husband of daughter Mary Richmond), John Palmer (husband of daughter Elizabeth Richmond), Silvester Richmond, Thomas Burge[ss] (husband of daughter Esther Richmond), and Sarah Richmond (an unmarried daughter in 1697?). There is no mention of the children, Ann Richmond and Henry Richmond that Edward Richmond had with Amy Bull, although they were living in 1697. Edward Richmond received a double share of the estate as the oldest son, according to Massachusetts Bay Colony laws. John Richmond received his own share and his sister Abigail (Richmond) Remington share. Why? Perhaps it was because Abigail Richmond had married John Remington (1650-1688) in 1679 and resided in Kingstown, Rhode Island in 1697. The eldest son, Edward Richmond, was named the administrator of the intestate estate. Apparently, The inventory is not included in any probate record. The bond and letter of administration is in the Bristol County, Mass. probate case file. The list of debts, account, and division of the estate are listed in the Bristol County, Mass. Probate Court clerk volumes. Edward Richmond was a resident and property owner in Little Compton, now in Bristol County, Rhode Island. In 1697, the Bristol County, Massachusetts probate court handled the Edward Richmond estate, and probably the estates of other Little Compton residents. Interestingly, these two sets of probate records do not contain the records in the other set. 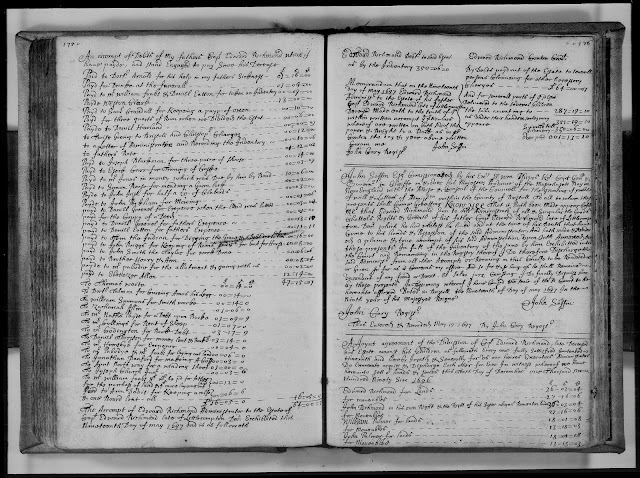 There was no index entry for Edward Richmond for 1697 in the Ancestry.com index (which is not surprising - Ancestry did a poor job of indexing the wills and probate records). Edward and Abigail (Davis) Richmond are my 9th great-grandparents. I descend through their daughter, Abigail (Richmond) Remington (1656-1744), who married John Remington (1650-1688).